Become “Survivor 5″ for Halloween! – Zombies, Run! Become “Survivor 5″ for Halloween! It’s available from just $23 in premium cotton and as an athletic wicking tee! 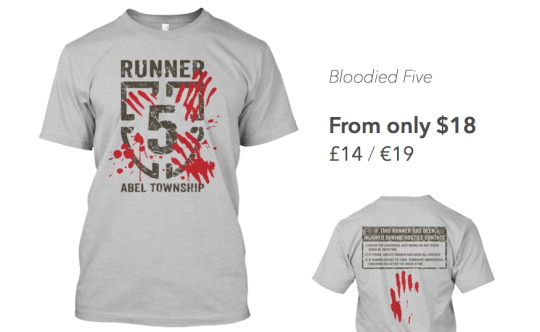 We also have our classic bloodied Runner Five tee making a comeback: this tee costs only $18 in premium cotton and athletic wicking fabrics. These tees will only be on sale until Saturday October 10th so that Teespring can get them to you in time for Halloween, so move (and run) fast! Good news! 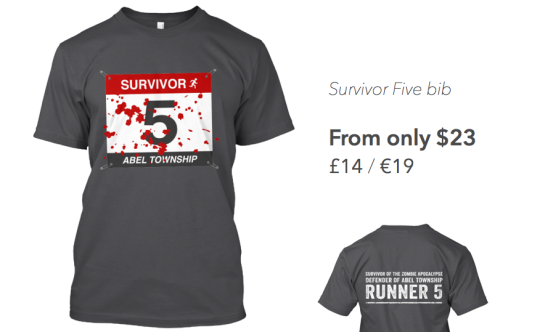 Teespring just opened a branch in Europe, so you can get our Survivor ‘Race Bib’ Five tee and our Bloodied Halloween Five tee for only £14/€19 with faster and cheaper shipping! Next Post Penultimate Season Four Missions!